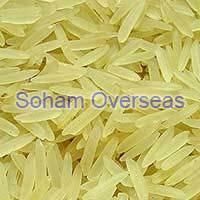 1121 Sella Basmati Rice Supplier In India - Get Best Price! Being a well-reckoned name in the market, Soham Overseas never compromises on the quality. We are one of the paramount 1121 sella basmati rice suppliers in India. Our offered assortment is free from insects, dust, and other foreign particles. We offer a top-notch range in a different quantity packs to satiate the wide-ranging requirements of the market. Widely used for preparing a biryani, kheer, pulao, and other delicacies, the offered 1121 sella basmati rice is well-received by the households, restaurants, departmental stores, and canteens. We make sure that the offered rice is firmly packed to minimize the chances of mishandling or spillage during the transit. For bulk and small orders, clients can ring us or e-mail us to acquire an inimitable assortment.